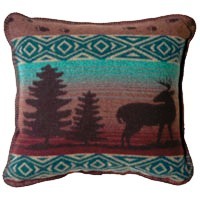 Deer Meadow has deer in the pine woods and black bear walking across a backdrop of warm turquoise and woody chestnut. 20" pillow with poly-fill pillow insert. Item: GWR-P2 Price: $69 ea.